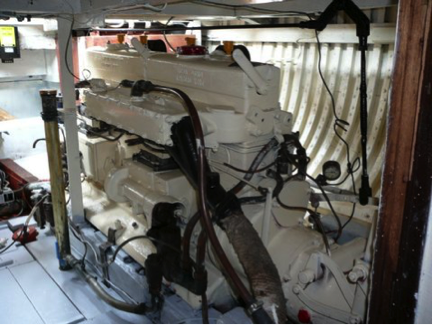 During her build at William Osborne's Yard, Aquabelle was fitted with two three-cylinder Ailsa Craig Diesel engines. They were built in Chiswick near London and designated RF3. The RF series had an 18.6:1 compression ratio and Ricardo whirlpool combustion chambers in the cylinder head with a flat piston crown, hence the designation 'RF'. Rated at 10 B.H.P. per cylinder at 1,200 R.P.M, Aquabelle's engines were 30 B.H.P. each, giving a total of 60 B.H.P. All cylinders of the RF series had a bore of 4 1/8 inches (104.78 mm) and a stroke of 5 1/2 inches (139.70 mm). With a 100 gallon fuel tank, Aquabelle could sail around 48 hours without the need to refuel at a cruising speed of 8 knots. Her engines weighed around 0.5 tons each. According to Lloyds Register of Yachts, Aquabelle's engines were replaced around 1956-1963 by two six cylinder Ailsa Craig Diesels, designated RF6, exactly twice the engine capacity and therefore twice the power, giving a total of 120 B.H.P. The identification labels showed that they were built at the Ashford factory in Kent, where Ailsa Craig relocated in 1949/1950 and production ended in 1963. It is not known whether the gearboxes are original or whether they were also changed as they were likely to be very similar. With a combined weight of 1.56 Tons, the new engines represented a significant extra weight. These engines power Aquabelle today. At some time in Aquabelle's history she was extensively strengthened by doubling the number of hull ribs from the forward end of the wheelhouse to her stern. At the same time her keel was lengthened by around 2m to finish close to her stern. It can only be assumed that this major work was undertaken at the same time her engines were changed. Unlike the originals, the replacement engines were not handed. It is possible that the keel was lengthened to provide extra directional stability and to provide hydrodynamic separation of her propellers, now turning in the same direction. The increased number of ribs was presumably to take account of the extra weight of her new engines.